Sauron is best known as the “Dark Lord of Mordor” from JRR Tolkien’s best-known work, The Lord of the Rings. He is the primary enemy of that epic novel, the creator and master of the One Ring, and the antagonist whose shadow lies across the land. He also appears as the off-screen presence the “Necromancer” in Tolkien’s first novel, The Hobbit. 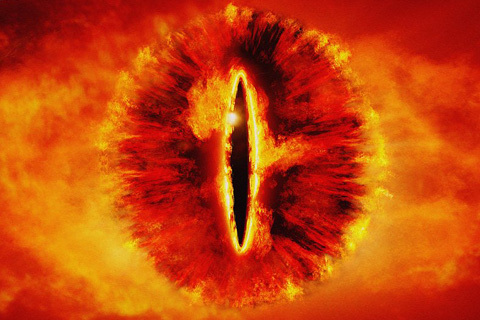 The ‘Lidless Eye’ of Sauron in New Line Cinema’s The Lord of the Rings. Those who have read further back into Tolkien’s legendarium realize that Sauron’s history reaches back to the very beginning of the history of Arda, Tolkien’s created world, where he was originally a Maiar, servant of the Vala Aulë. Aulë is the master craftsman of the Valar, so Sauron’s roots show a “creative” aspect, a trait that surfaces often throughout his history, most particularly in his creation of the One Ring, which he creates to dominate the other ‘Rings of Power’. “In his beginning he was of the Maiar of Aulë, and he remained mighty in the lore of the people. In all the deeds of Melkor the Morgoth upon Arda, in his vast works and in the deceits of his cunning, Sauron had a part, and was only less evil than his master in that for long he served another and not himself.” (pg 20). “He loved order and coordination, and disliked all confusion and wasteful friction. (It was the apparent will and power of Melkor to effect his designs quickly and masterfully that had first attracted Sauron to him. )” (pg 396). Sauron quickly became one of Melkor/Morgoth’s most powerful and trusted lieutenants. During the First Age, before the coming of the Eldar, he was given command of the stronghold of Angband. When the Valar learned of the awakening of the Elves, they decided to wage war against Morgoth for the protection of the Firstborn. During the Battle of Powers, Morgoth was taken by the Valar and imprisoned outside the confines of the world. Sauron escaped capture by hiding deep within the pits of Angband. He bided his time while Morgoth served the term of his sentence, three long ages in the void beyond the world. Morgoth was eventually released, suing for pardon from the Valar, and the Valar granted him freedom. He quickly reverted to his old ways, sowing discord amongst the Eldar against the Valar. Eventually Morgoth rebelled in truth, destroying the Two Trees of Valinor and stealing the jewels known as the Silmarils from Fëanor of the Eldar. He fled with them back across the seas to Middle Earth. Fëanor and his kinsmen followed Morgoth, taking a vow to reclaim the Silmarils at all costs, beginning a cycle of wars between Morgoth and the Elves that would last throughout the entire First Age. Sauron was waiting when Morgoth returned, in possession of the Silmarils and ready to rebuild his former strength. Morgoth took up abode at Angband, and Sauron became his most trusted lieutenant. Sauron was already well-known amongst the Sindar, or Grey Elves, who had remained in Middle Earth after the Battle of Powers instead of crossing into Valinor with their brethren. They named him Gorthaur the Cruel, a fearsome sorcerer who could change forms as he wished, at times appearing fair and beautiful, other times taking the form of a werewolf. Among Sauron’s servants were werewolves, dark spirits trapped in the bodies of large wolves, and vampires. Chief among them were Draugluin, the Father of Werewolves, and the vampire Thuringwethil. Two years after the Dagor Bragollach, Battle of Sudden Flame, he captured the Elvish island-stronghold of Tol Sirion, renaming it Tol-in-Gaurhoth, the Isle of Werewolves. He also played a role in capturing Barahir’s men of Dorthonion by tricking one of them, Gorlim, into betraying the whereabouts of his companions. Ten years later, he captured Finrod Felagund, the Elven King of Nargothrond, and Beren son of Barahir and took them to the tower of Tol-in-Gaurhoth. There he and Finrod strove for mastery in a duel of “songs of power”, and Sauron was the victor: “But though their kinds were revealed, Sauron could not discover their names of purposes” (Silmarillion pg 168). So he cast the prisoners into a deep pit, threatening to slay them all cruelly if they did not tell him the truth of their purpose. One by one the prisoners died, as werewolves devoured them in the darkness, until only Finrod and Beren remained. When the werewolf came for Beren, Finrod burst his bonds and slew it, but was himself mortally wounded. Lúthien arrived at that moment with Huan the Hound of Valinor, and Sauron did battle with Huan in wolf-form, but Huon overcame him and he yielded mastery of the tower to them. After the War of Wrath, when the Valar once more assaulted Morgoth and cast him out into the void (this time for good), Sauron surrendered himself to Eonwë the Herald of Manwë, who told him he must travel to Valinor and be judged by Manwë. Fearing the judgment of the Valar, he fled into Middle Earth and hid, gradually returning to his evil ways when he had become convinced that the Valar would take no more interest in Middle Earth. Gradually, as the years passed, Sauron became more and more confident that the Valar had forsaken Middle Earth, and he began to gather power and minions. Around the year 1000 of the Second Age, he chose the land of Mordor as his stronghold, and built the Dark Tower of Barad-dur. Mordor was a waste of volcanic plains and, surrounded on three sides by mountains, virtually unassailable. He corrupted many men to his service, and desired to do the same of the elves. Assuming a fair shape he traveled among them as Annatar, Lord of Gifts. Gil-galad saw through his fair-seeming guise, but others among the elves were not so keen and with ‘Annatar’s’assistance they crafted the Rings of Power. Then Sauron returned to Mordor where he secretly fashioned the One Ring to dominate all the other rings and enslave their wearers to his will. To create such a ring, however, he passed much of his strength and power into it. The wearers of the three Elven Rings – Vilya, Naria, and Nenia – perceived him the moment he put on the ring and hid the Rings away. Sauron was enraged and invaded Eriador and Eregion in 1695, destroying both and slaying the elven smith Celebrimbor. He also captured the nine rings of power belonging to men and the seven belonging to the dwarf lords. Several years later, a fleet of Númenóreans arrived to shore up Gil-galad’s army and Sauron retreated to Mordor with the tattered remnants of his forces. Over the next 1500 years, he rebuilt his forces and created the most fearsome of his minions, The Nazgul, by giving the nine rings of power to men and enslaving them with the One Ring. He gained power over the men of the east and the south, who worshiped him as a God-King, and also over the former servants of his old master Morgoth, the orcs and trolls. Near the end of the Second Age, he was attacked by an army of Númenóreans under their King Ar-Pharazôn, and the might of Númenor at its peak was too great even for the Dark Lord’s forces, who refused to do battle with the massive force of men. Still, Sauron saw some means to achieve his purposes through cunning, and he submitted himself to Ar-Pharazôn and was taken back to Númenor a “prisoner”, though he was secretly pleased with the arrangement. Dominating the minds of the Númenóreans is precisely what he did. As a few years passed, he went from ‘prisoner’ to the chief advisor to the King, who fell more and more under his sway. The Númenóreans – aware of their mortality and the immortality granted to the elves – had already grown distant from the elder race, and the Dark Lord fed that resentment further, inciting the Númenóreans to rebel against the very Valar themselves. Sauron was still a master of shapes and forms, and he took a fair shape and whispered poison into the ear of the King, seeding the Númenóreans distrust of the Elves and the Valar. He persuaded them to tear down their temple to Eru, the One, and to worship Morgoth instead. A massive temple was built, where human sacrifice was carried out. Eventually, he stirred the Númenórean King into action. The Valar kept the deathless lands to themselves, he claimed, and if only Ar-Pharazôn would take them, he too would become immortal. So Ar-Pharazôn gathered his fleet and sailed into the west, breaking the ban of the Valar. Yet even Sauron did not foresee the massive tumult that the Valar would call down, when Manwë called upon Eru. The seas sundered and opened, the entire fleet of Númenóreans were destroyed, and the isle of Númenor itself sunk into the abyss. Sauron, bereft of his physical form, returned to Mordor as a shade, and he could never again assume a fair shape. A few Númenóreans, distrustful of Sauron and still faithful to the Valar, had sailed from the island before the launching of Ar-Pharazôn’s fleet. Chief among these were Elendil and his sons, Isildur & Anarion. They established the realms of Gondor and Arnor in Middle Earth, on the very doorstep of Mordor, in the same year that Sauron returned to Barad-dûr. Yet the Dark Lord had taken the One Ring with him from the Downfall of Númenor, and once back in his stronghold he began to once again gather his strength, foreseeing that Middle Earth was much weakened by the loss of the Númenóreans. As is related in The Fellowship of the Ring, Gil-galad and Elendil decided to strike before the Dark Lord of Mordor could regain his full strength. Thus began The War of Last Alliance to destroy him once and for all. Sauron’s forces were defeated on the plain of Dagorlad and Sauron himself was besieged inside his fortress of Barad-dûr for seven years. Finally, he came forth to give battle, fighting with Elendil and Gil-galad on the slopes of Mount Doom. Both heroes were slain, but Sauron was also cast down. Isildur, the son of Elendil, cut the One Ring from the Dark Lord’s finger with the broken shard of his father’s sword. With the loss of the One Ring, Sauron’s spirit fled his body and went into hiding. So the Ring survived, and was soon lost by Isildur, when he was attacked by orcs near the River Anduin, where it sunk to the very bottom of the river, until it was found by Deagol and his friend Smeagol, as is told by Gandalf in The Fellowship of the Ring. Smeagol, who became known later as Gollum, took the Ring deep into the roots of the mountains, where he became a slave to its power. And there the Ring passed out of all knowledge for more than 500 years. So the Ring into which the Dark Lord had invested so much of his power endured, and so Sauron endured. A shade only, but biding his time and building his strength, until the Ring should be found again and make its way back to his Master. Sauron first began to gather his strength again in the stronghold of Dol Guldur, on the southern edge of Mirkwood Forest. Eventually he was driven out of Dol Guldur, but by the time he had regained sufficient strength to return to his old fortress of Barad-dûr and rebuild. At this point the story of Sauron and the One Ring enter the narrative of The Hobbit, when Bilbo Baggins, a hobbit from the Shire, finds the One Ring in Gollum’s cave. Gollum pursues Bilbo in an attempt to reclaim the Ring, but is instead captured by Sauron and under torture reveals that he had possessed the One Ring. The Dark Lord sends his Nazgûl to the Shire to retrieve the Ring, but Bilbo’s nephew Frodo, who now has possession of the ring, escape and heads for Rivendell, with the Black Riders on his heels. In Rivendell, the decision is made to destroy the Ring once and for all, even though that means bringing the Ring right to the Dark Lord’s front door, since the only place it can be destroyed is the fire where it was forged, in Mordor. In the midst of war, Frodo and Sam took the Ring to the very fissures of Mount Doom. There, unable to contend any longer with the power of the Ring, Frodo claimed it for himself and refused to destroy it. Gollum, who had followed them, attacked, biting the Ring off Frodo’s finger but falling into the abyss where the Ring was destroyed. Mount Doom erupted as the Ring was destroyed. The Nazgûl “crackled, withered, and went out” (The Return of the King pg 224). With the Ring passed the greater part of Sauron’s power, and he was utterly destroyed and never rose again.